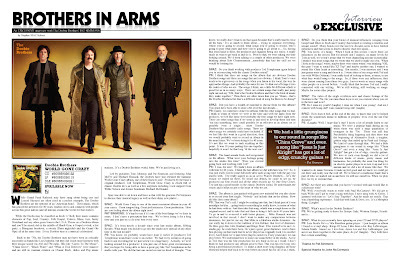 Discussions Magazine Music Blog: An EXCLUSIVE interview with THE DOOBIE BROTHERS' Pat Simmons! An EXCLUSIVE interview with THE DOOBIE BROTHERS' Pat Simmons! While Grand Funk Railroad may have sung about being one and Lynyrd Skynyrd are often cited as a perfect example, The Doobie Brothers are the epitome of an ‘American band’. Their music, which has graced the airwaves for 40 years, reaches out to and connects with people across this great nation (and all nations around the world for that matter). While the Doobs may be classified as Rock ‘n’ Roll, their music contains elements of Pop, Soul, Country, Folk Gospel, Zydeco, Blues, Jazz, funky Dixieland and any other genre born in the U.S.A. Throw on a Doobies album and you’ll be smack dab in the middle of Mardi Gras, a Gospel revival, a frat party, a Bluegrass hoedown, a sweaty Blues nightclub and the Grand Ole Opry all at the same time. Every Doobies tune is a musical celebration! Back in the ‘70s, the Doobie Brothers may not have been as critically successful as bands like Led Zeppelin, but they did reach more listeners with their unique sound via AM and FM radio. Hits like “Listen To The Music”, “China Grove”, “Black Water” and “What A Fool Believes” were massive and are still in constant rotation on Classic Rock, oldies and Pop music stations. It’s a Doobie Brothers world, baby. We’re just living in it. Led by guitarists Tom Johnston and Pat Simmons and featuring John McFee and Michael Hossack, the Doobies have just released the fantastic World Gone Crazy album, one of their finest to date. Produced by the band’s original producer, Ted Templeman, World Gone Crazy is chock full of classic Doobie do’s as well as a few surprises including vocal support from Willie Nelson and former bandmate Michael McDonald. SPAZ: World Gone Crazy is one of the most consistent albums in your 40 year career. Great songwriting. Great performances. Great production. How are you feeling about the album right now? PAT SIMMONS: It’s hard to say if it’s one of the best things we’ve done in years. I don’t have a perception that way. We’ve been doing it for a long time and you just try to do your best every time. SPAZ: It’s been nearly a decade since your last studio album, Sibling Rivalry. What made you decide to go into the studio now instead of any other time in the last decade? PS: You know, we probably would have done it earlier if (producer) Ted Templeman would have come to us earlier. We had every intention of going back in and recording but we just weren’t in a huge hurry. Actually, we were looking around for a producer: it was just one of those great circumstances that you hope for, being able to have a great guy like Ted Templeman in the studio with you. We did the last one ourselves and we kind of thought, “You know, we really don’t want to do that again because that’s really hard to wear all the hats.” It’s so much to think about… trying to organize everything, where you’re going to record, what songs you’re going to record, who’s going to play what parts and how you’re going to go about it… So, having that extra hand in there, the producer and engineer being one entity, it really made us want to go back in and do it. Prior to that, we were taking our time looking around. We’d been talking to a couple of other producers. We were thinking about Bob Clearmountain…somebody that had the skill set we would be looking for. SPAZ: Do you think working with producer Ted Templeman again helped you in reconnecting with the classic Doobies sound? PS: Easily, we could have done two albums with the other songs that we had. I think in terms of where we were at the time and with the input from the producer, we felt like these were probably the best songs we have right now. There are other songs that if we went in and tried to develop them and turn ‘em into something, they could possibly be as effective as an album cut or possibly even a single… more Doobie Brothers-like accessible radio songs. There are other songs we certainly could have included. If we feel like this went in a good direction, then we would probably want to record an album in the near future. We’ve been doing it for 40 years. It’s not like we want to rush anything at this point. It was 10 years putting this one together; hopefully it won’t be that long ‘til the next one! SPAZ: The band sounds fresh and invigorated on the album. What were your feelings going into the studio this time? Were you excited going back and working with Ted? PS: I was, for sure! We hadn’t done an album with him for 28 years. I think the last album we did with him was ’81? So, it was just really cool to come full circle after such a long time with the guy you started with. Ted really signed us as an act to Warner Brothers… he’s the reason we ended up there. He heard our demos, he came to see us, he produced our first record and all the other records up ‘til One Step Closer. Ted just has a good handle on the classic Doobies sound. He understands the vision and it helps us get to the heart of who we are. SPAZ: The album is jam packed with great new material but you also chose to re-record your first single, “Nobody’ and include that on the album. How did this idea come about? PS: That was Ted’s call. I might be reading into this, but I think part of it was nostalgia for him… going back to something he really knew, in terms of what he had done with us. And then take that song, which was a rough demo on the original record, and to take that and then to bring it full circle 40 years later. To go in and to re-record it with better players…. Mike Hossack was not involved in that record. I don’t want to make any comparisons between drummers, but just let me say that Mike is a fabulous studio drummer…he can really lay it down in the tradition of Jim Keltner, that level of drummer. He likes guys like John Bonham and Ringo Starr. If he wanted to be an L.A. studio guy, he could have been. He’s just a great, great drummer. And to have him playing on that track that he never played on originally took it to another level. And I think we’re just better players ourselves. Forty years later, we can play better. We understand how to make our sound better in the studio. As far as Ted, that was his first production for any band as far as I recall. I don’t think he had produced any albums prior to that. This was his real foray into being a professional producer. To make a short story long (laughs), all those elements helped that track to be way better and more fun for all of us, I think. PS: You know, it’s funny. When I look at this record, I know there are influences on the record. But for myself and I suspect, on many levels for Tom as well, we weren’t aware that we were channeling anyone in particular. I think it was more songs that we wrote that we tried to make our own. When I look at the songs I wrote, maybe there were times when I was thinking “OK, this part I want to sound like ZZ Top” and maybe another one, I wanted to sound like Chris Isaak or something. But mostly, I was unaware and I was just gonna write a song and there it is. I wrote three of my songs with Ted and one with Willie (Nelson). I was really kind of looking to them, at times, to see what they would bring to the songs. So, if there were any influences, they were almost coming from those two guys. I never wrote so many songs with other people on a record before. I really liked that because Ted and I really connected with our writing. We’re still writing, still working on songs. Maybe for some other project. SPAZ: The video of the single combines new and classic footage of the Doobies in the ‘70s. Do you miss those days or are you content where you are in the here and now? SPAZ: How does it feel, at the end of the day, to know that you’ve helped create the soundtrack music to millions of peoples’ lives over the last four decades? PS: (Laughs) Well, I hope that’s true! I know a lot of people listen to our music. We were a popular band during an era when there was such a huge population of teenagers in the ‘70s. There was still that Psychedelic thing lingering and then there was the beginning of Alternative Rock: a tougher, grittier edge that ended up in Punk and Grunge. We kind of came through that. We had a little grunginess to our sound in songs like “China Grove” and even a song like “Jesus Is Just Alright” has got a lot of edgy, crunchy guitars. We love to rock even though we did a lot of different kinds of music, pretty music and harmonies, but probably the most fun thing for an electric guitar player is to turn it up and let it sustain and we did a lot of music like that. We wanted to do music because it made us feel good and we knew we could get out there and really tear the roof off. We’re kind of a roadhouse band: that’s part of who we started out as and how we still see ourselves. When we play live, we try to recreate that. SPAZ: Are there any artists that you haven’t worked with and would like to collaborate with? 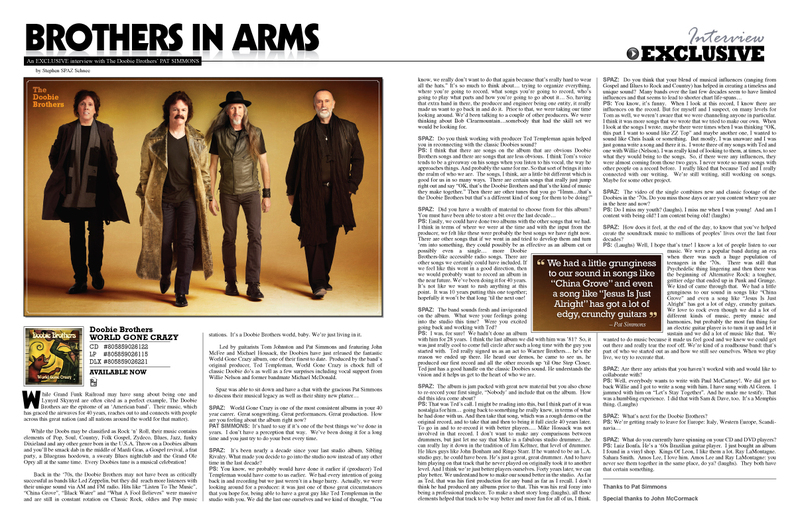 SPAZ: What’s next for the Doobie Brothers? PS. Luiz Bonfa. He’s a ‘60s Brazilian guitar player. I just bought an album I found in a vinyl shop. Kings Of Leon, I like them a lot. Ray LaMontagne. Sahara Smith. Amos Lee, I love him. Amos Lee and Ray LaMontagne: you never see them together in the same place, do ya? (laughs). They both have that certain something.